Hulu Plus, Netflix, Amazon Prime offer compelling alternatives to cable TV for those who don’t want to subscribe to regular cable. But what if you could subscribe to an Internet-based cable TV service that doesn’t need a set-top box, has a DVR-like catch-up TV feature and great search and still lets you watch live TV right on your regular smart TV at home (or stream shows from your iOS device to your Apple TV using AirPlay)? That’s what Magine has built and is launching in Sweden on Monday. There, users in this “First Edition,” as Magine calls it, will be able to pay about ten euro per month to get about 30 channels after their 30-day trial period ends. Those 30 channels including many local channels, as well as CNN International, BBC World News, National Geographic, Cartoon Network and others. The company plans to add more channels as it secures the rights to them. 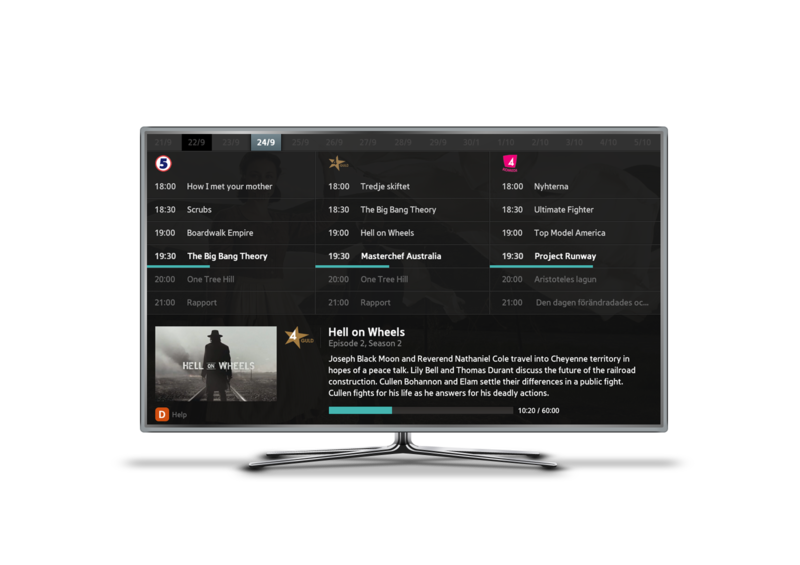 Magine is essentially a cable TV startup – a cable operator in the cloud – and thanks to the deals it has with its local broadcasters and the payment structure for compensating broadcasters that is in place in Europe, the company only pays a per-user fee to the broadcasters that are currently in its line-up. Because it runs as a cloud service, it doesn’t have any of the capital expenses the legacy cable systems face (there’s no need to lay cables and maintain them, after all). I first saw a demo of Magine at DLD in Munich earlier this year and have been a happy beta user ever since. Sadly, the way the U.S. broadcasting and cable system is set up, it’s unlikely that we’ll see Magine here anytime soon, but as the Magine team told me, the company has big plans to expand across Europe and is talking with a number local and pan-European broadcasters to make this possible. Indeed, as Magine stressed when I talked to them earlier this week, it’s important to remember that this is not some rogue outfit but it’s moving ahead with the blessing of the broadcasting industry. The broadcasters are happy to work with Magine, after all, given that the company adds money into the value chain and is basically just another distributor. All of that is pretty cool, but the team also build a great user experience that shows what cable TV in the 21st century should look like (and will make your old Comcast box feel even more antiquated than it already did). You can access the service on the web, on mobile and on your TV. Once you are in the beta, you can watch on the web or install the app on your phone and tablet, but that’s just the first step. Magine also has apps for the Samsung and LG smart TV platforms and Samsung will even start pre-installing it on new TVs it sells in Sweden. Because both the mobile and TV apps all connect to the cloud, you can even control your TV from your tablet or phone – or you can use your regular TV remote, too. To create the connection between the TV and mobile device, Magine simply displays a QR code on the TV, you scan it with your device and the two are now connected. Unlike most cable TV platforms, Magine features a great search tool and other discovery mechanisms. You can get a standard TV Guide-like grid view of you channels, or you drill deeper down and catch up on recent programs that way. For most channels, Magine features at least a 7-day DVR-like archive and many channels even give it 30-days of catch-up TV. Starting on Monday, Magine’s current beta testers will be upgraded to the new version, which includes the better search and discovery tools. After that, the company will start to invite those on its waiting list to join as well as it scales the service up over the coming weeks. This is clearly a very ambitious company, but if the current beta is any indication, it has a chance to become a major player in Europe and even though we aren’t likely to see it launch in the U.S. anytime soon, we can always hope that something similar will come along here, too.